I’ve been noticing this trend evolve over the past couple of years or so, and I feel like it’s building toward critical mass: more designers are using this outdoorsy material on fashion-y items, and outdoorsy brands are creating more stylish iterations of it. This Vince hoodie is an excellent case in point, and you can also find it on sale in a nice off-white (but alas, in limited sizes). I’d wear this asymmetrical jacket the same way I would a hoodie: under a jacket or over a sweater. How cute is the color combination on this pullover hoodie? It also comes in black, if you’re allergic to color. 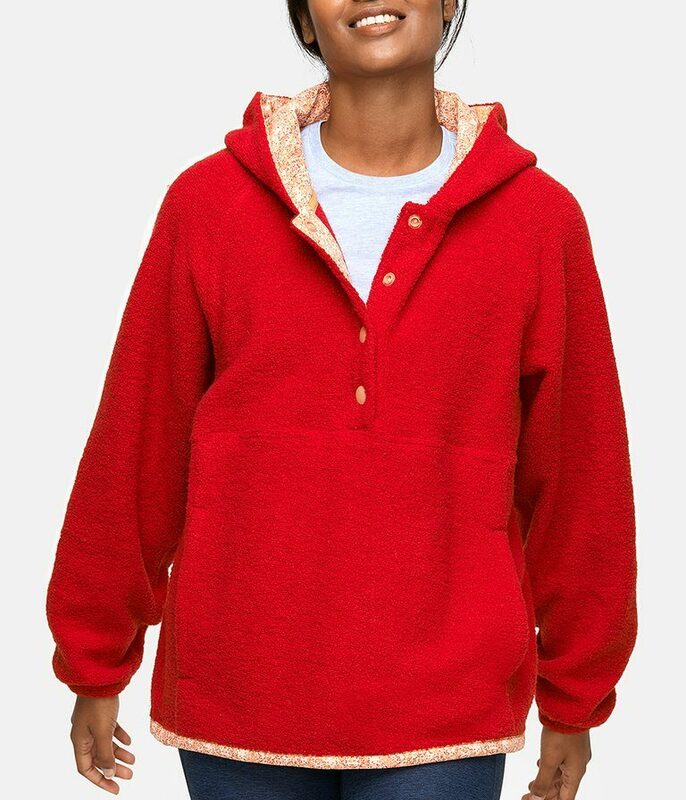 From Outdoor Voices: another cute pullover hoodie in a nice vibrant red. And here’s a straightforward hoodie that looks warm as all get-out. I like that this is ever-so-slightly cropped; it’d look great with high-waisted jeans. 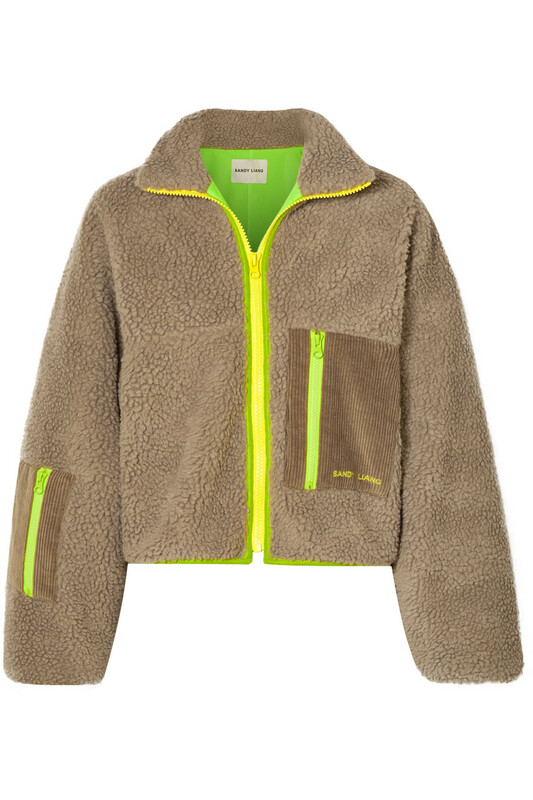 Designer Sandy Liang has been turning out cool fleece items for a while now, and I like this jacket, with its fun corduroy patch pocket, quite a lot. The yellow here really pops nicely. 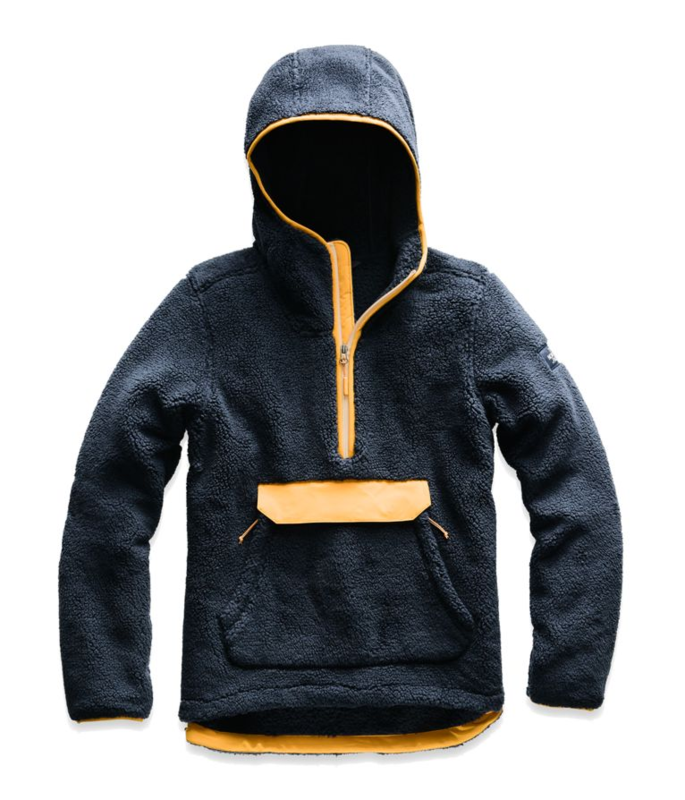 I love a pullover zipper hoodie for lounging about, and this one is just aces. This vest makes for a warm—and adorable—extra layer. The pink trim here is an unexpected delight. 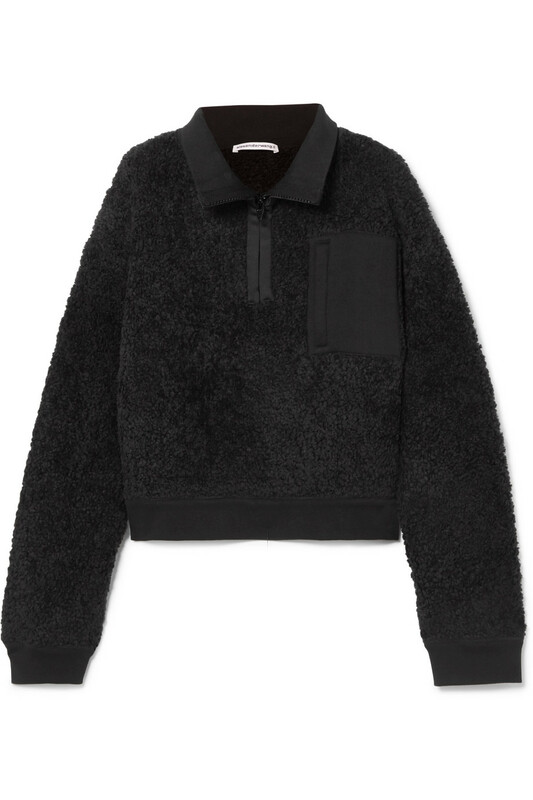 I’d wear this half zip top under a V-neck sweater. Such a great shape on this cocoon coat. 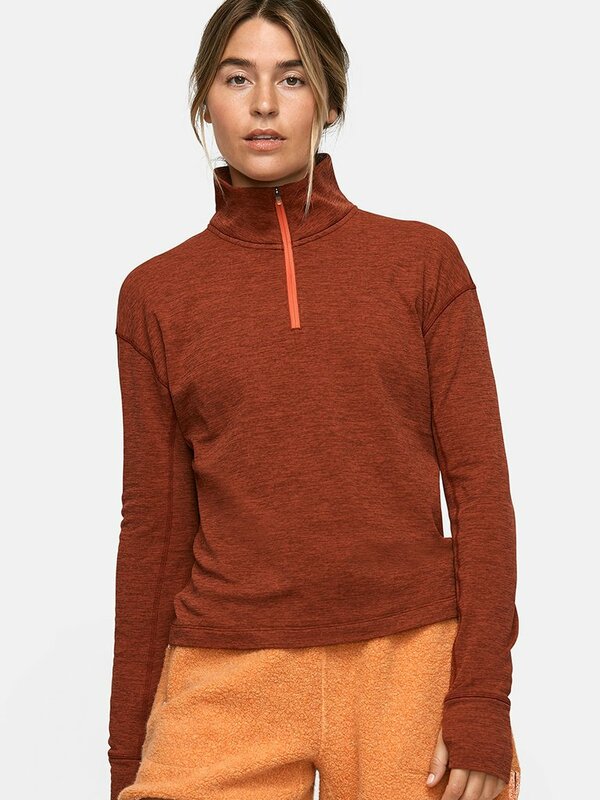 This sweatshirt is from Everlane, and it’s made of recycled plastic, which is cool. It also comes in several colors, if mustard yellow isn’t your jam. the West Coast, I cant abide by the fleece outerwear. I’ve tried and tried. It always looks frumpy and sloppy on my body. A few months ago I tried on several Patagonia, North Face, LL Bean, and other manufacturers fleece options. My middle schooler just laughed and laughed at each option. 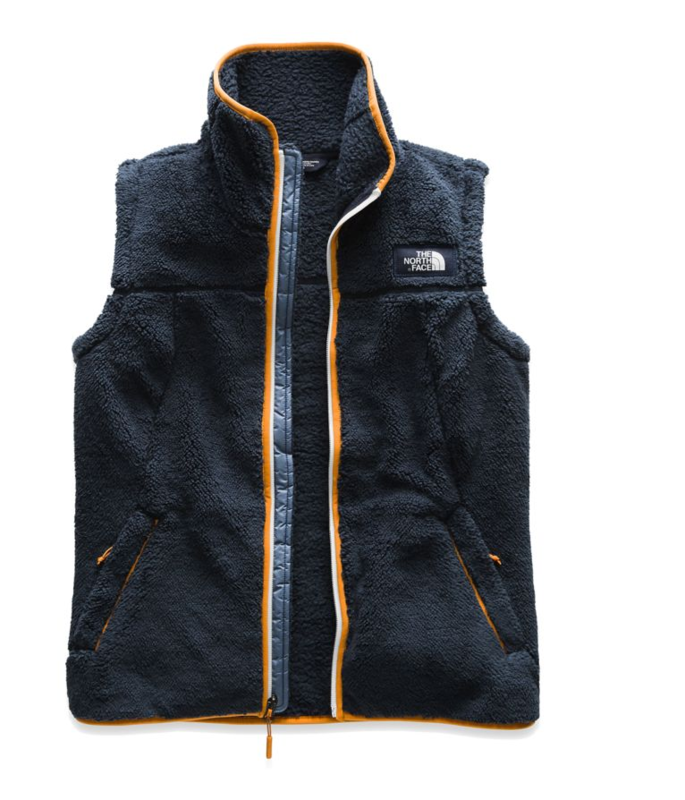 As a transplant to New England from the West Coast, I cant abide by the fleece outerwear. I’ve tried and tried. It always looks frumpy and sloppy on my body. A few months ago I tried on several Patagonia, North Face, LL Bean, and other manufacturers fleece options. My middle schooler just laughed and laughed at each option. Fleece anything makes me look gigantic. Can’t do it. But if I was forced to wear fleece, these are pretty cute. Fleece anything makes me look gigantic. Can't do it. But if I was forced to wear fleece, these are pretty cute. 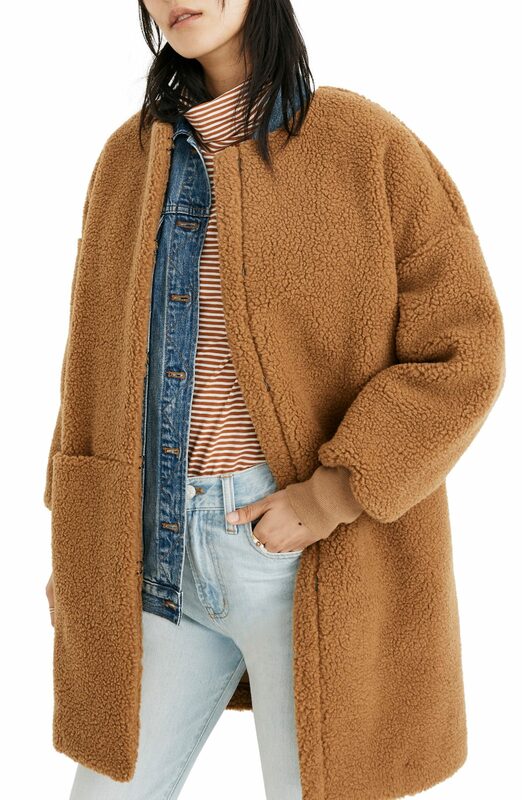 I love the look of those fleecy, cozy “teddy bear” coats on everyone else, but I’d look like “Mama Moose,” to quote my mom. 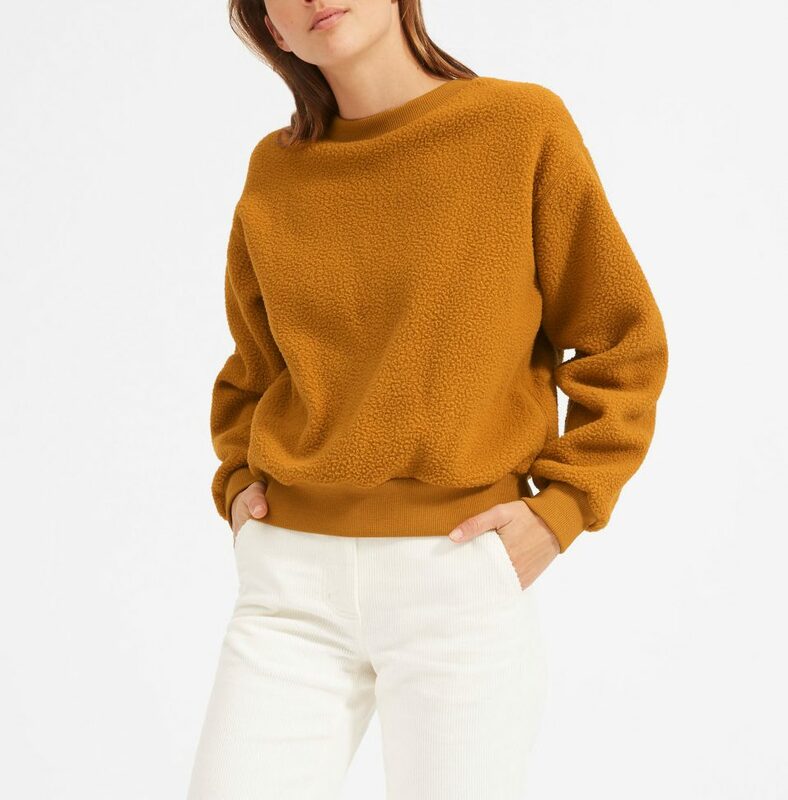 And while sunshine yellow looks absolutely deadly on me, the shade catshit is oddly flattering, hence, I’m pulling the trigger on the Everlane sweatshirt. There was a problem with fleece? And now, why black fleece? 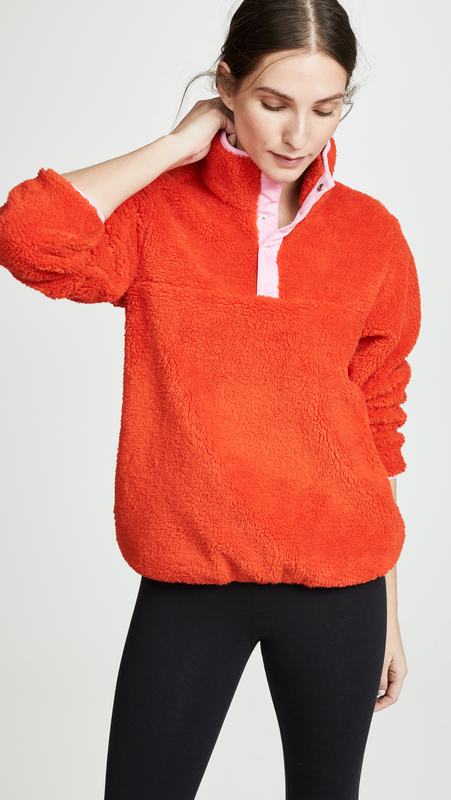 It’s fleece – no one is going to think you are going to the opera in it. Idt it will fool anyone. And … except for the first two items and the pink-trim one … I don’t see much difference between these items and any other ones. I wouldn’t say no to the Alexander Wang black cropped number. I wouldn't say no to the Alexander Wang black cropped number. Love love love the Sandy Liang, the back is fabulous, EEK at the price tag. Like Seattle, lots of people wear fleece here in Iowa, mostly sports motif, overwhelming & commonplace. But if I could swing for the Sandy Liang piece, I would wear the sh$t out of it – especially today with the wind chill below zero and oodles of snow on the ground. Love love love the Sandy Liang, the back is fabulous, EEK at the price tag. Like Seattle, lots of people wear fleece here in Iowa, mostly sports motif, overwhelming & commonplace. But if I could swing for the Sandy Liang piece, I would wear the sh$t out of it - especially today with the wind chill below zero and oodles of snow on the ground. I love fleece except for the pet hair factor. I feel like it gets woven in there and is hard to get out over time! 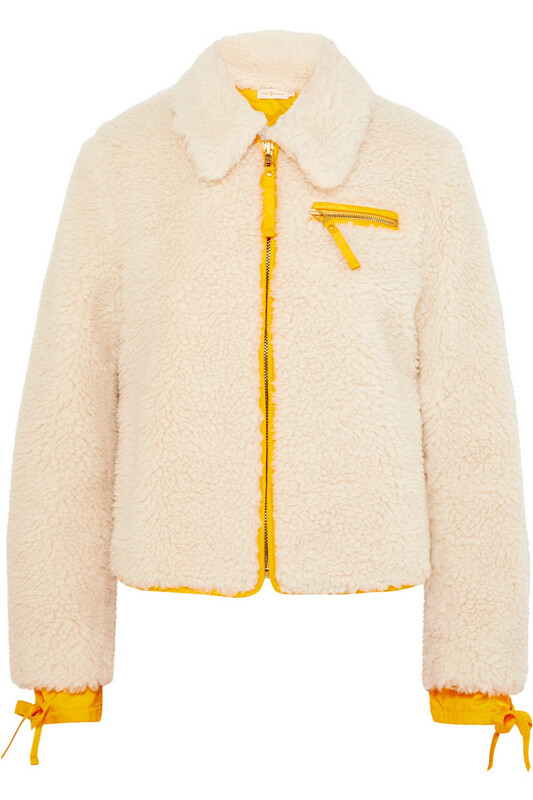 It seems to me that fashion has taken another step into cozy/comfy/floofy because of all of the turmoil in the world. That asymmetrical jacket (that I love) reminds me of something Helmet Lang would have designed. You’re undoubtedly correct in that theory, kimbersam! Nearly all of these are take-offs on the Patagonia originals! I often wear fleece (I even have fleece long underwear!) so this post is right up my fashion closet. 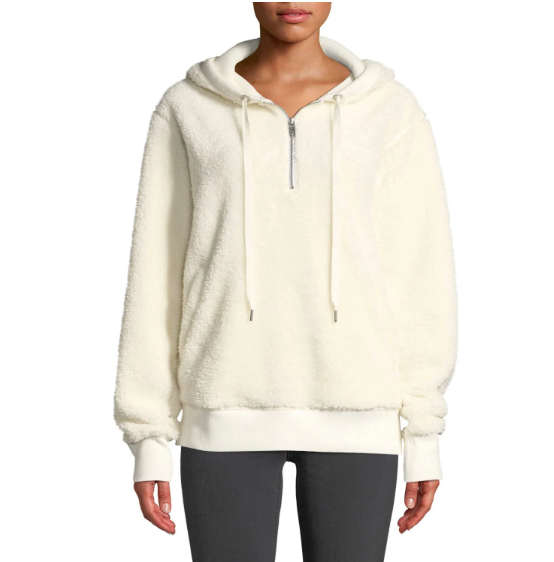 Side note: I have the fleece Everlane pullover and it is super, super thick and warm and a bit bulky so it doesn’t easily fit UNDER another coat. I love it. I often wear fleece (I even have fleece long underwear!) so this post is right up my fashion closet. Side note: I have the fleece Everlane pullover and it is super, super thick and warm and a bit bulky so it doesn't easily fit UNDER another coat. I love it. Living in Seattle for the past 12 years (after 20 years in NYC), and proudly never wearing fleece, I truly laughed out loud with your “chic-ification of fleece”. I have loyally read and loved your blog for years but trust me, it is worn year round out here by everyone, and it is never chic. 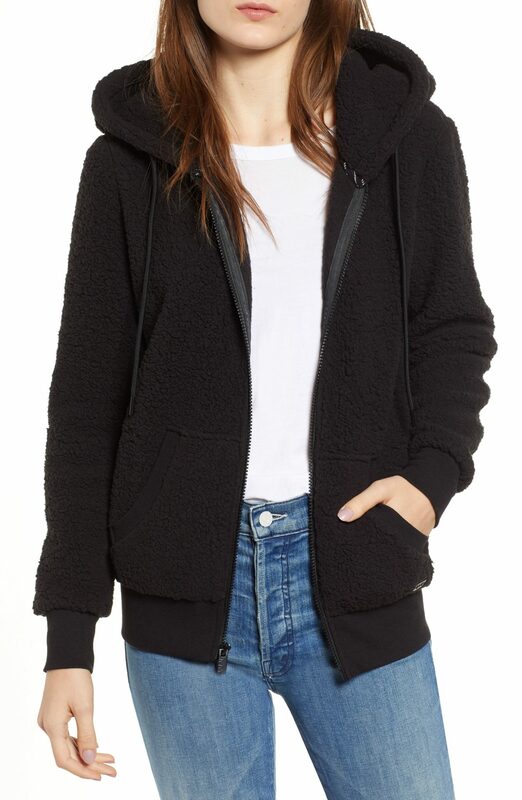 Living in Seattle for the past 12 years (after 20 years in NYC), and proudly never wearing fleece, I truly laughed out loud with your "chic-ification of fleece". I have loyally read and loved your blog for years but trust me, it is worn year round out here by everyone, and it is never chic. I think living in Seattle could put a person off fleece forever (I lived there briefly) and mine is just one opinion, but I stand by it. I lived in Seattle for what felt like a bazillion years (reality was probably more like 16-18 years)––it’s where I was introduced to fleece because I regularly cross country skied and backpacked. But the fleece I wore in those days was not fashionable, strictly functional. And ALL my fleece clothing came from REI, of course! I moved away from Seattle in 1994 and have no idea of how the fashion world goes there now, but when I lived there I refused to wear flannel plaid shirts or Birkenstocks so I totally understand your mind set, Ann! I lived in Seattle for what felt like a bazillion years (reality was probably more like 16-18 years)––it's where I was introduced to fleece because I regularly cross country skied and backpacked. But the fleece I wore in those days was not fashionable, strictly functional. And ALL my fleece clothing came from REI, of course! I moved away from Seattle in 1994 and have no idea of how the fashion world goes there now, but when I lived there I refused to wear flannel plaid shirts or Birkenstocks so I totally understand your mind set, Ann!